Investigators now believe a Malaysian jet that vanished was commandeered by a "skilled, competent" flyer who piloted the plane for hours, a senior Malaysian military official said on Saturday as Prime Minister Najib Razak prepared to address the nation. 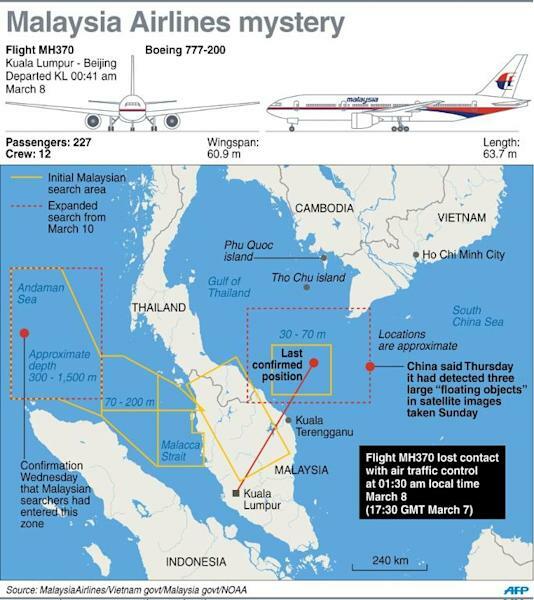 Speaking to AFP on condition of anonymity, the official cited Malaysian military radar data that investigators believe indicate the Boeing 777 may have radically changed course and headed northwest towards the Indian Ocean. "It has to be a skilled, competent and a current pilot," the official said. "He knew how to avoid the civilian radar. He appears to have studied how to avoid it." Prime Minister Najib's office said on its Twitter account that he would address the media at 1:30 pm (0530 GMT). It gave no further details, but the official's comments and the planned press briefing raised expectations of a major announcement in the case. Najib has so far left press briefings in the crisis to lower-ranking officials. The plane's intended flight path for the Kuala Lumpur-Beijing journey was to be north over the South China Sea and Vietnam. The new information, coupled with multiple corroborative but unconfirmed reports, suggests the investigation into the disappearance of Malaysia Airlines flight MH370 is increasingly focusing on something going wrong in the cockpit. Analysts have said that could include a sudden loss of cabin pressure or other mechanical event that incapacitated the pilots, catastrophic pilot error, or more sinister possibilities such as the plane being commandeered by a hijacker or rogue member of the flight crew, or pilot suicide. All signs so far point to a "controlled, deliberate act, not a mechanical failure", said Scott Hamilton, managing director of US-based aviation consultancy Leeham Co. The mounting reports of an unexplained banking to the west have coincided with a shift of search and rescue resources towards the Indian Ocean. A US destroyer and surveillance plane joined expanded search operations Saturday in the Bay of Bengal. The international search effort had focused in its early days on the South China Sea. Pentagon spokesman Colonel Steven Warren said the USS Kidd guided missile destroyer and a P-8 Poseidon aircraft had been deployed to the "western search area" in the Andaman Sea and Bay of Bengal. The Boeing 777, with 239 passengers and crew on board, vanished on March 8 over waters between Malaysia and southern Vietnam. The night was clear and no distress signal was received. The hunt had initially focused on the South China Sea but has shifted dramatically given the absence of any findings, and following the indications the plane altered course. India's navy said it was doubling, at Malaysia's behest, the number of ships and planes it had deployed to search the Indian Ocean waters around its remote Andaman and Nicobar islands. The six vessels and five planes were concentrating on an area "designated" by the Malaysian navy in the southern region of the Andaman Sea, naval spokesman D.K. Sharma told AFP. 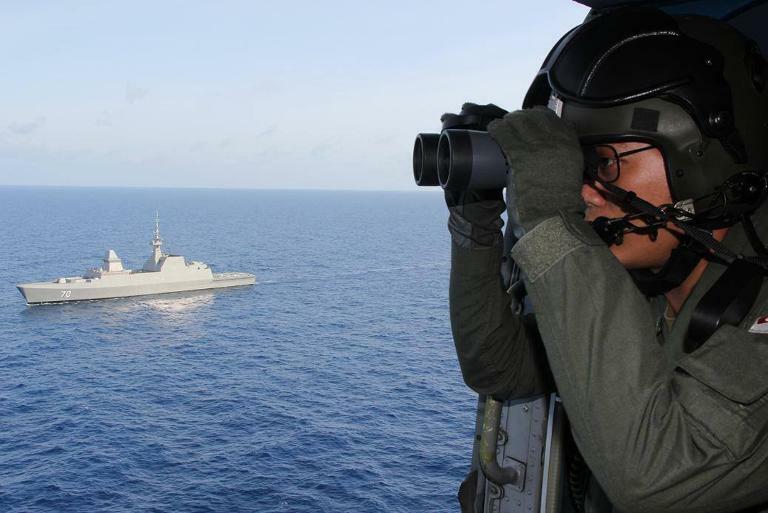 Close to 60 ships and 50 aircraft from 13 countries have been deployed across the entire search zone since MH370 went missing. For distraught relatives of the passengers and crew, the expanded search offered no immediate relief from the anguished frustration of a week tainted by false leads and rumours. "Right now, anything is possible," said a middle-aged Chinese woman in Beijing who had a relative on the flight and complained of a lack of information. "We keep hoping there will be some good news, but it's not going well." 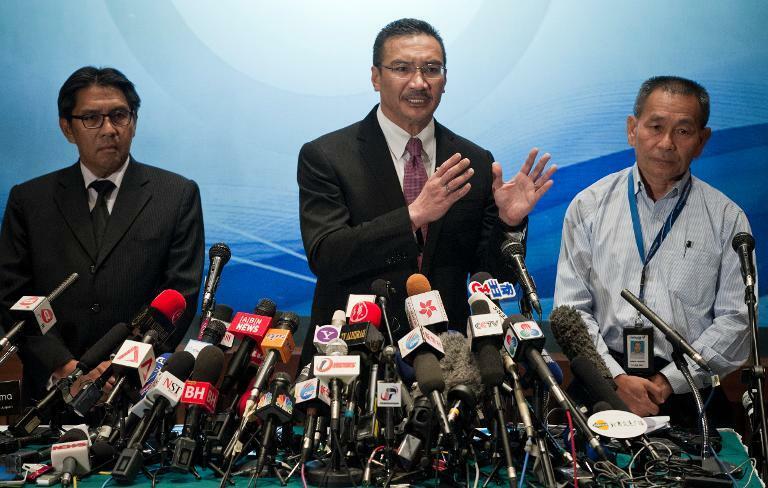 Malaysian Transport and Defence Minister Hishammuddin Hussein on Friday repeatedly refused to comment on what he termed "unverified" information, as reports of an altered flight path mounted. Multiple US media reports also had cited unidentified officials as saying a satellite continued to detect the plane's automated communication system for hours after radar contact was lost. The New York Times reported that Malaysian military radar data had shown the airliner altering course at least twice and changing altitude -- sometimes erratically. Hishammuddin confirmed the expansion of search operations in the Indian Ocean. The widening of the geographical search parameters poses enormous logistical challenges for wreckage identification and recovery. The vast Indian Ocean has an average depth of nearly 3,900 metres (12,800 feet) and any debris would have been widely dispersed by currents after a week. "Wind and sea conditions are definitely going to play a very big part if there is wreckage, and if it happens to be in the Indian Ocean. It is an immense area," said Greg Waldron, Asia managing editor for aviation industry magazine FlightGlobal. If it does turn out that Malaysian military radar tracked the missing aircraft, there will be questions as to why the air force was not sent to investigate a large plane flying with no transponders over a strategically sensitive region. The plane has one of the best safety records of any jet, and the airline also has a solid record.